The new virtual scoreboard, installed by Griffin Sports LLC, is a 16mm pro-team quality display measuring 17’ x 32’. 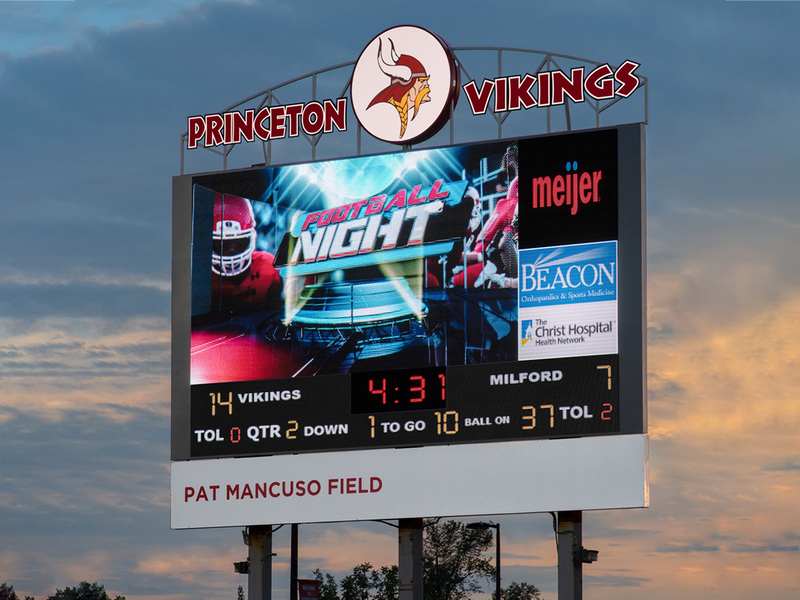 It replaces an old combination fixed digit board and video display, and can be used for different sports at Princeton’s Viking Stadium. The school already has used the scoreboard for both football and soccer games, each team able to easily and cost-effectively customize content to meet the needs of its sport. Both the video and digit portions of the old scoreboard started to fail during the 2017 football season, according to Chris Lockhart, director of technology at Princeton City Schools. “Since we planned to renovate the stadium, the school board was very supportive of upgrading to a full video scoreboard that would really make an impact in the community,” said Lockhart. Using Watchfire’s new Ignite Sports software to power the scoreboard, display operators can divide the scoreboard content into zones, which gives them the flexibility to display one large scoreboard or a combination of graphics, videos and sponsor messages. The software makes it easy to create, manage and deliver game-time content, including scores, statistics, animations, live video, instant replays and advertising. Students in some art classes soon will be involved in creating content for the board, and the school plans to train students on how to program and run the display. Located in Sharonville, Ohio, Princeton High School serves grades nine through 12 and draws students from the neighboring areas of Blue Ash, Deerfield Township, West Chester Township and Springfield Township. The school campus also has Watchfire monument signs located at the high school/middle school campus entrance and outside the athletic facility that broadcast messages to students, parents and the community.